For a new era that demands more, and a whole new generation that expects more, I am thrilled to introduce two new devices that deliver more, please say hello to the brand new Galaxy A-80 and Galaxy A-70. These were the words addressed by none other but the Samsung’s President & the CEO, DJ Koh at the live event which took place on the 10th of April in Bangkok City, Thailand. It left the entire Samsung audience mystified as they were expecting the much anticipated reveal of the Galaxy A40 and the Galaxy A90 models. 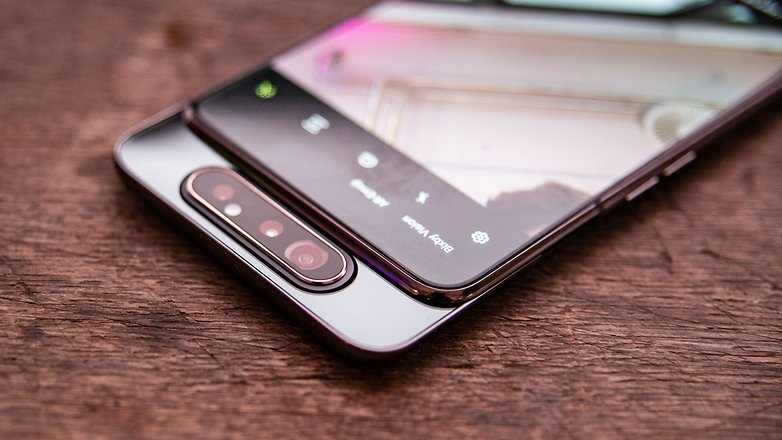 Instead, they were greeted with completely different phone models of the A-series, the Galaxy A70 and the Galaxy A80. When we begin to design the Galaxy A-series, we had one goal in mind, to help these digital pioneers push the limits of Live Mobile Communication and give them access to the best of what they truly need in the era of Live. Built for the future era of the Live, these phones are specifically designed to meet the modern day requirement of the ever-growing market of influencers. This time, Samsung has kicked things up a notch with its massive reveal of the Galaxy A80 and Galaxy A70. It’s one of the first smartphones of its era which comes with a rotating camera mechanism. Normally the camera’s on the back are more powerful than the front facing cameras, but with the new phone, you can easily flip the back camera to the front and have the same experience. All thanks to the rotating pop up camera which is available on both models. The camera setup comprises of a 3D Depth module (specs unknown), an ultra-wide 8-megapixel f2.2 (128-degree) module and the primary 48-megapixel f.20 snapper. All you have to do is tap the lens flip button on the main screen and it flips the camera for you. The camera of 48 MP + 8 MP on the Galaxy A80 beat hands down the camera of the Galaxy A70 which is 32MP + 8MP + 5MP. Both the phones have a 25W super fast charging. 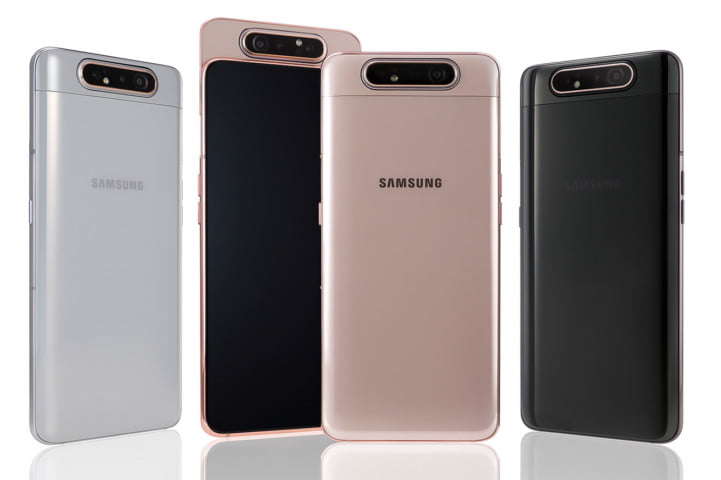 The Galaxy A80 & Galaxy A70 series has a slightly bigger display than the Galaxy A50. But when it comes to RAM speed, Galaxy A80 stands above the Galaxy A70 with an 8GB RAM. The Galaxy A70 has 6GB RAM instead of an 8GB RAM. Both, A70 & A80 have 128GB storage space. While, A50 and A70 contains microSD card slots, the A80 model does not support microSD cards. On the other hand, the Galaxy A70 has a bigger battery pack than the Galaxy A80 which has a battery pack of 3700mAh. The battery pack for Galaxy A70 is around 4500 mAH. It’s important to have a display which is spontaneous as your ideas are, as the first Galaxy device with the full-screen design, the A80 offers the perfect canvas for you to explore. No front facing camera notch. The New infinity display is a screen that is all screen. It means that you can now watch just about anything you want without any distractions. With the new infinity display edge-to-edge, you can now enjoy every vibrant pixel of every image, every video and every story that you stream on your smartphone device. The phone display is also optimized for multi-tasking. You can split screen and watch videos and at the same time respond back to your business queries through social apps of choice. The full screen display might baffle the mind of an average user making him wonder where is the front facing camera? or how does my voice delivers through the microphone? or where is the speaker? It’s actually all there behind the screen. The mic is embedded below the screen. Now, while taking a call, you can hear your friend through the display and talk back to them. Both, Galaxy A70 and Galaxy A80 comes with an on-screen fingerprint support so only you can access the device. The onscreen fingerprint reader is fused to glass. The image resolution of the Galaxy A80 (8000 x 6000) is better than the image resolution of the Galaxy A70 (6500 x 4920). The prices for both the phones are yet to be confirmed. For now, all we know that both the phones, the A80 and the A70 model are releasing with aluminum frames encased in what Samsung terms as the 3D glass. They come in three sparkling finishes; the Phantom Black, Angel Gold and the Ghost White. The phone is known to work epic from both the sides. You can now create Live focus videos with super steady support which creates videos as if you are watching a movie. Additional to the intelligent camera, it also comes with an intelligent battery saver support feature. The phone automatically adapts to your routine and adjust the battery settings for max. Use. It also comes with Intelligent Performance Enhancer which learns how you use the phone and predicts which apps you are going to use and optimizes its performance accordingly. Without a doubt, the Samsung Galaxy A70 and the Galaxy A80 is one of the interesting eye-catching designs in the mid-range smartphone category. I hope this article was an informative read. Do you have any questions? Well, what are you waiting for! Go ahead and ask us questions, we are more than willing to interact with you. Participate with us in the actively growing TechWireHub community on Facebook.